La Nuit des Musées was held yesterday April 8. It was a night where select museums in Lebanon opened their doors for free to the public (see full list of collaborating museums here) for one single night, with free shuttles roaming around and going from one stop to another every 30 minutes to transport art enthusiasts to the different museums. I was so excited to take my kids and be part of this entire experience, but I wasn’t able to start my tour very early as I had some unfinished work to take care of. 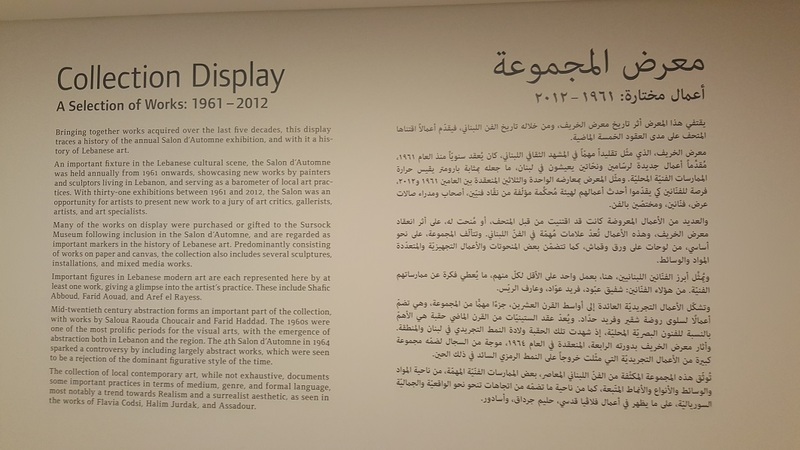 Hence, I found myself heading to my first stop, Sursock Museum, at 7:00 p.m.
On any given day, Beirut’s traffic jam is unbearable, so it was no surprise to find ourselves stuck in crazy traffic on this specific night. We parked really far away and proceeded to the museum on foot. We arrived at Sursock Museum and I was delighted with the positive vibes, although it was nonetheless too crowded and not too organized due to the shortage of security staff. I really had to wait at the door for about 10 minutes as no one would even make way for me. I was just standing in line, waiting for my turn to enter, while people were coming in from behind me, pushing me and making their way in to the museum. I mean, we are in 2016, this should no longer be tolerated! Once inside, I made sure to tell my 6 year old not to touch anything at all. After all, he is a kid and he wants to explore everything, but I explained to him that such pieces of art should only be admired and looked at from a distance. We made a tour and decided to leave and try to visit another museum, and it took us an entire hour just to be able to get to our car! It was 9:00 p.m. already, my kids were sleepy, and traffic was getting worse. I sadly decided it was time for us to go back home. You might say to me that I should have started my tour earlier, but frankly I don’t think that would have changed anything. The traffic was heavy, the museums were overcrowded, and the security was good, but should have been better. For this reason, I believe such an event deserves to be held for two consecutive nights and not just one. Even though not everyone who goes there is really into art in their normal lives, but at least they are making an effort and they do deserve to be given the chance to admire their own country’s rich heritage. 6- Quieter contemplation of the pieces of art. 7- More museums to visit. 8- More time for the guards to explain each painting/artwork. To conclude, I hope the organization of this even gets better next year. Some people come from remote areas to enjoy this night and the limited time shouldn’t keep them from being part of this artful experience. It’s 2016. Such Typos should No Longer be Made!